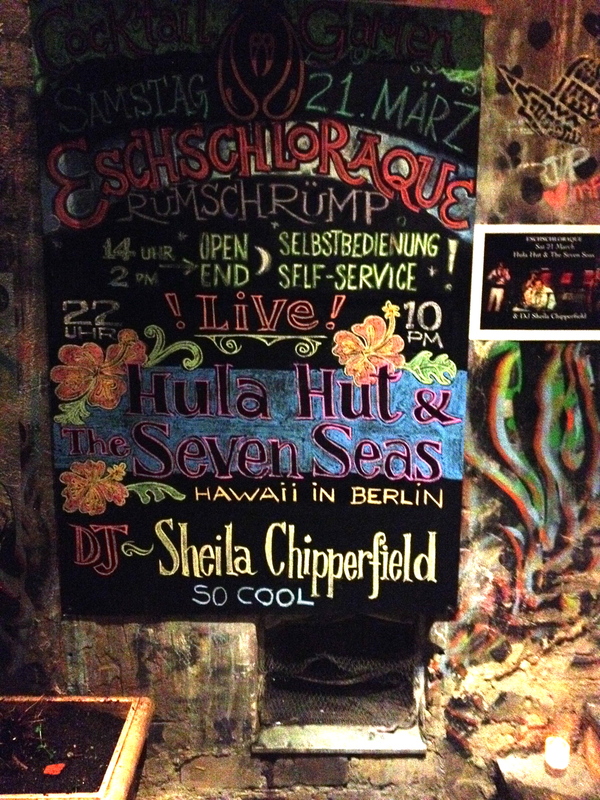 Aloha, yesterday we played at the great Bazar Noir Design Store in Kreuzberg. We had so much fun playing in that incredible environment with all these beautiful things and people. Mahalo for having us. Aloha friends, yesterday we were playing at the premier of the legendary modern dance and performance series Lucky Trimmer #24. That was a great event with great people, thanks Lucky Trimmer for having us ! We Played this amazing event last friday, great people, great art, we had a great time. Unfortunately Taylor couldn’t make it because he was touring with Mocky, but we will perform all together united again on November the 14th at Ausland. Hope to see you there! 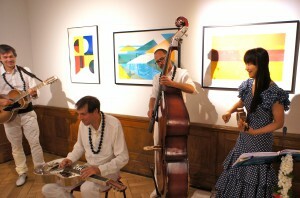 Mahalo everyone for coming by yesterday night, we had so much fun, hope you too ! And who ever did the blackboard painting: great job : ) !!! Aloha everyone! 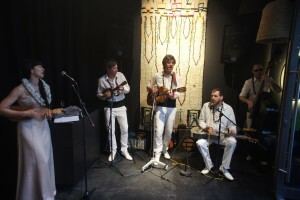 Hula Hut and the Seven Seas performs “E Mama E” in honour of International Women’s Day 2015. The song tells of saying goodbye to mother before leaving the island for the mainland; through her tears, she vows to return. Composition credited to Hiram Kaehu. Mahalo to Jeff Fisher for his assistance and the Neurotitan Gallery Berlin. Hello and Aloha to everyone! 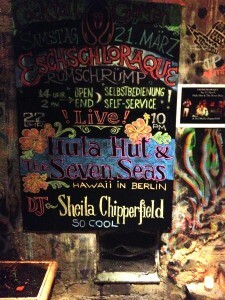 Welcome to the home page of Hula Hut and the Seven Seas. Finally our website is up and we’re thrilled to host a space for concert appearances, news and interesting stories about what we do and why we do it. 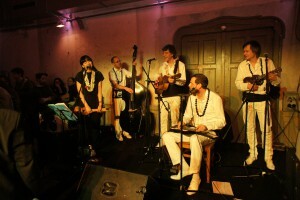 As far away as Berlin is from the island of Hawaii, we feel a close kinship with the sounds of the “golden age of recorded music”, and enjoy playing the bizarre yet standard repertoire of the genre, including tributes to Sol Hoopii, King Benny Nawahi, Genoa Keawe, and many, many more brilliant characters. Please subscribe to our newsletter (bottom of the page) to get the latest news ! Thanks for visiting our site; any and all questions and requests are welcomed. We’ll be seeing you soon.